With so much information at our immediate disposal these days, almost anyone can become an expert on anything. 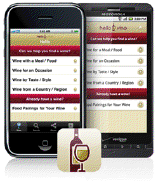 Here are a few FREE wine apps that I’ve taken for a test drive. Have a dish planned and need a wine pairing? By simply selecting from drop down lists, you can enter your protein, cooking method, sauce, starch and veg, and the Wine Guru will take it from there! The app asks you for your preferred price range and then provides three wine pairing options, by producer. The wine choices are interesting and well thought out – you can tell it was designed by a true wine nerd! One criticism is that the “find this wine nearby” button isn’t currently active, however, one of the wines suggested when I tested it out was from BC, which leaves me hopeful that it will suggest locally available choices in the future. An already well-established app, Hello Vino provides more of an all-round service for a broad range of knowledge levels and types of queries. I like the reversible food and wine pairing feature, which will either pair a wine to what you’re eating, or a dish to what you’re drinking. The app recommends several grape varietals, which can be narrowed down by producer. I love how it even takes stylistic and sub-regional differences into consideration when selecting the grape or wine type. This little ‘pocket somm’ is both user-friendly and intuitive! Our government liquor stores have launched this new app that allows you to quickly and easily access information on the wine bottle in front of you (providing it’s a BC Liquor store listed product). With your smart phone, simply scan the bar code on the back of the bottle and access tasting notes, pricing, and availability. You can even record your own rating or review! The app also has a food and wine pairing feature which recommends a gamut of wine options – they’re much broader and less specialized than the previous two, but still useful.